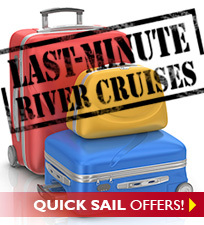 River and small ship cruises are fun, safe, affordable, and hassle-free! River cruising is the fastest growing part of the overall worldwide cruise industry. River cruising is the most demanded vacation for "boomers" looking for a destination intensive, safe and easy paced vacation. River Crusing is wonderful for couples as well as solo travelers and offers a immersive destinational experience and a very cost effective vacation alternative to ocean cruises or bus touring. Here’s the company line: We think a river cruise is today’s best international vacation value and provides both couples and "solo travelers" with the most rewarding, most luxurious, hassle-free and most relaxing way to experience many of the most beautiful and storied regions of the world. But, we also understand if you’re not totally sold yet, and need a bit of convincing. That's why we wrote this article: to show you some very good reasons why a river cruise is the best vacation choice today. Please read on. The folks at Premier are travel and river cruise experts. You may have read elsewhere on the site that our Premier Team is very experienced (most have 20+ years in the travel industry) and has been fortunate enough to travel the world. We’ve also been on almost every major ocean going cruise ship and many of the river ships we sell. That said, we’re probably much like you: over 50, enjoy travel, enjoy learning as much as we can about a region, its people and their culture rather than struggle through a, “if it’s Tuesday it must be Belgium”-type of vacation. Sure we still want to experience it all, but would prefer to do it with people “like me” who share similar interests, are fun, enjoy exploring and learning, and want a bit of pampering along the way… you know, by day you want to interact with the people and places you visit and by night you want a fine Cabernet, a poached fresh salmon with asparagus, and great accommodations for the night — right? Yep. When you book with Premier, one of our river cruise experts will become your personal travel planner whose sole goal is to match you with the right cruise and the best cruise line to suit your lifestyle, destination choice, and budget. They’re always eager and capable of answering any questions you may have. And they'll be available to you every step of the way from choosing the perfect river cruise for you, aboard ship, until you return home. River cruising is easier and more intimate than a land tour or ocean cruise. Maybe you've been on one of the newer generation of mega-cruise ships, you know the ones we mean: the ones you share with 3500-5000 of your “best friends;” the crew never knows your name; you wait in line for almost everything; and it can take up to two hours to disembark the ship, only to wait in yet another line to get on a shore excursion bus so you can "enjoy" an over-priced tour. Who enjoys that, no matter how “cool” the ship is? I also would prefer not to think about the rigors of a traditional bus tour with 50 or so folks, making a stop every two hours for a look at another curio shop, one more church, or to allow someone yet another “restroom” break! And, do you really want to spend 13-15 nights in hotels you didn’t choose, packing and unpacking each day of the journey, eating from very selective menus in restaurants you don’t know, and complaining that everything costs too much? I wouldn’t and don’t think you would either. So why not do what so many experienced travelers are doing? Choose a destination from your personal “bucket list,” book a very affordable river cruise vacation and leave the driving to the ship’s captain. Meander along stunning rivers whose banks and hillsides are lined with medieval castles and vineyards, visit ancient and mystical places along the Nile River, explore the alluring floating markets of the Mekong River as it winds through fascinating Vietnam, or explore China’s incomparable Yangtze. Today’s luxurious river cruise ships allow you to experience any of these extraordinary places you’ve yearned to explore — in an up close and personal manner. A little about the award-winning river cruise lines we feature. Today’s modern river cruise ships operated by distinguished companies such as AmaWaterways, American Queen Steamboat Company, Avalon Waterways, Scenic°, Uniworld Boutique Collection, Tauck and Viking have all the creature comforts including; gourmet food accompanied by a election of complimentary fine regional wines and beers, very spacious and luxurious accommodations, all with a great river view [no inside cabins on river ships], many with a balcony, in cabin entertainment including first run movies, U.S. TV shows, FREE wifi and much more. Your value-packed price also includes a wonderful array of guided, English only sightseeing tours, and even includes free bicycles for your enjoyment. Do you still need a bit more convincing? Just think about this… unpack and pack only once, do as much as you want or very little as you control the pace, exercise off the calories in the gym or relax in a sauna or on some ships, swim in the pool. You’ll also spend much more time seeing the places you visit because river cruise ships usually dock right in the center of town [many with overnight stops], where you are only footsteps away from the local residents, the best sights, and if you choose a great walking streets for you to sit and enjoy a pastry and espresso as the world passes before you. Oh yes, river cruise ships stay later in port and in many cases that allows you to go ashore after dinner to get a different view of the city at night. And, one last thing… if you’re like me, I love the fact that they don’t require you to dress up each night while you are on vacation. Leave the tux and the formalwear at home, and at dinnertime dress in relaxed, casual resort attire — it’s your vacation, why not enjoy it! Premier's one-of-a-kind river cruise programs. Milestone Events. Do you have a milestone event such as a special birthday or significant anniversary coming up? If so, there’s no better way to truly “celebrate” than on a value-packed and wonderfully rewarding river cruise. And, there’s no better way to get the most out of the celebration than by bringing a group of family or friends along with you to help celebrate! Premier is the first travel company to recognize the importance of such milestone events by providing you and your guests who travel with you special cruise values, onboard acknowledgement of this important event, and special gifts. To learn more about how we share in your very special event, please see our Milestone Event section for complete details. Quick Sail! This is our very unique last-minute cruise program for those of you that can take a cruise at a moment's notice and enjoy the deepest discounts available. 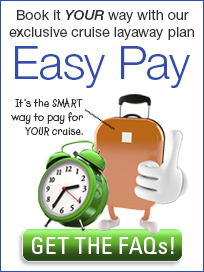 If you can cruise with 90, 60, or even less than 30-days notice... CLICK HERE to sign up and register your cruise preferences. Then get ready, pack your bags, and get ready to go! We make sure that you’re thoroughly prepared and ready to enjoy your river cruise. For many, traveling to foreign lands can be a bit daunting and at times even overwhelming. With that in mind, the Premier Team has taken their many years of international travel experience and created an exclusive, destination-specific COMPASSPOINT™ Guide Series. Each Guide in the series is chock-full of valuable information and hints that will help you plan, prepare, and even pack for your river cruise… right down to what the temperature will be in each place you visit, at the time of your visit. If you’re doing a pre and/or post land stay, your personalized COMPASSPOINT™ Guide will also reveal some of our personal-favorite sightseeing hints and useful information on local transportation, cool restaurants, best shopping opportunities, best photo-ops, and even local tipping customs — all guaranteed to greatly improve the enjoyment of any river cruise, make it “hassle free” and truly one of your best vacations ever. These extraordinary guides cover all major river cruise destinations in Europe, Russia, Southeast Asia, China and Egypt and are FREE when you book with Premier, the best travel agency around to help you select, plan, and prepare for your dream-come-true river cruise vacation. Your decision process can best be concluded by taking a few minutes to read our article entitled, A Day in the Life of MY River Cruise! This diary-style article lets you see what a typical day on a river cruise ship is like. Then we suggest you speak with one of our Premier river cruise experts who will act as your Personal Travel Planner to find that perfect river cruise, one that will fulfill your personal desires. Or, click on this link if you would prefer to see a few of our suggestions for a great first river cruise vacation. Shakespeare’s famous question and response has been uttered for centuries, “What’s in a name? A rose by any other name would smell as sweet” On the river cruise topic, we’d have to mightily disagree with the bard... as a river cruise by any other name — bus tour, ocean cruise — is simply NOT the same!